Harley Williams on the ball during Peterborough Northern Star's FA Vase win over Blackstones. Photo: Tim Gates. All-conquering Peterborough Sports have received the perfect first round draw in the FA Vase. Sports, who are three points clear at the top of the United Counties Premier Division, will host Eastern Counties Premier Division side Swaffham Town at PSL on Saturday, October 22. Laureano Da Silva on the ball as Peterborough Northern Star beat Blackstones 4-0 in the FA Vase. Photo: Tim Gates. Swaffham are without a win in nine league games this season. Sports beat Eastern Counties Premier Division leaders Mildenhall 3-1 away from home in a qualifying round tie on Saturday (September 24) when Swaffham were winning 4-1 at UCL strugglers Huntingdon. Yaxley have also drawn Eastern Counties Premier Division opposition, but their game will be a lot tougher, The Cuckoos will entertain sixth-placed Stanway Rovers at In2itive Park. 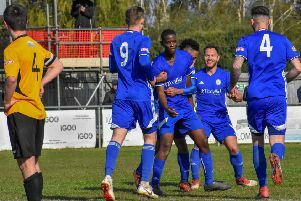 Peterborough Northern Star, 4-0 winners over Blackstones in Saturday’s qualifying round, have been rewarded with a home tie against South Midlands Premier Division side Sun Sports. Holbeach United travel to Midlands Combination outfit Coventry Copsewood. Local ties (to be played Saturday, October 22). Coventry Copsewood v Holbeach United. Peterborough Sports v Swaffham Town.